The now-anonymous original poster who forgot the link wrote: I'm sorry, but the wild card game is not a game where the players get together to play some mashup of Pokemon and Magic the Gathering using their own baseball cards. i'm afraid that is one of the comics that only make sense if you have more topical knowledge than the characters. speising wrote: i'm afraid that is one of the comics that only make sense if you have more topical knowledge than the characters. I don't know crap and I can infer that Mike Trout is a sportsball player of sorts and LA Lakers and Denver Broncos are teams that play different sports. It makes sense. Whether topical knowledge makes it funnier or not, I don't know. well at least you added city names to the teams, so you know *some* crap. This is either the most boring xkcd in years or else it's Randall trolling the sportsfans amongst us nerds. I fail to see the humor in being proud and vocal about one's lack of knowledge in any field. Yeah, it's less dangerous when the field is sports rather than, say being POTUS, but still. J%r wrote: I thought the LA Lakers were a women's team, because of the movie Bowfinger featuring the Laker Girls. I don't know if that's a joke or not, but for the record, the Laker Girls are their cheerleaders. Paula Abdul was one before she had a singing career, and that is basically all I know about them. But hey, at least you didn't confuse the Lakers for the Nicks, like Arin did on a recent Game Grumps episode. The extra joke if you know sports is that the Lakers are actually more likely than average to be fans of the team Mike Trout plays for. He managed to pick the right city the first time, while getting the wrong sport. ??? The Lakers are Los Angeles, he plays for Anaheim - they aren't even in the same county. Thesh wrote: ??? The Lakers are Los Angeles, he plays for Anaheim - they aren't even in the same county. Funny how the team is called the Los Angeles Angels isn't even based in Los Angeles. TIL. Last year I found out that the Dallas Cowboys play their home games in Arlington, and apparently their headquarters are in Frisco. What the heck? I must know even less that the characters. I have no idea what they're talking about. Like, I don't even know how to intone the words. Is "on-base" a verb? Is it a noun like "home base" in base-ball? What does it mean to "slug"? Wait, maybe this is base-ball! He talks about hitting things, after all, and that's a thing that happens in base-ball! Must be pretty exciting too, if they've got brontosaurus involved. cellocgw wrote: This is either the most boring xkcd in years or else it's Randall trolling the sportsfans amongst us nerds. I feel like this in any area I've approached largely from my own reading and haven't talked about extensively with other people, taken classes in, or otherwise normed myself to the expectations of which bits I really ought to know. I'll have detailed knowledge in this spot over here, and then someone will make reference to some other thing that invalidates whatever I was thinking due to some much broader concept I'm not aware of. So I can relate to the strip situation. Right. I think the joke is similar to Music Knowledge, where again Cueball has stumbled into a situation where he is highly knowledgeable about certain random things, but has missed the big picture. Sure, now. Back when I made a small attempt at following them (my stepfather worked for the father of one of their players), they could have been called the Irving Cowboys. I don't read the comic that way at all. Randall is good-naturedly poking fun of his knowledge of baseball being a mile deep and an inch wide, as the saying goes. 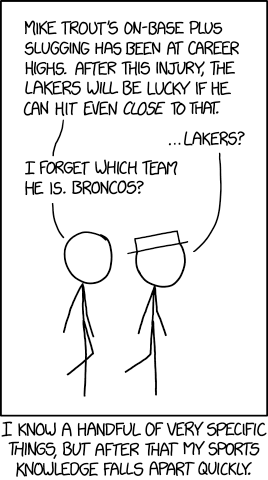 The humour derives from the juxtaposition of Randall knowing about a fairly esoteric baseball statistic like OPS, but not knowing which team Mike Trout plays for, nor does he realize that the Lakers and Broncos play completely different sports. If I remember correctly the New York Giants play their American Football in New Jersey. I was going to add that Mike Trout is often considered to be the best individual player currently (or ever) in baseball, but has historically been overlooked for awards because the rest of his team is mediocre. Many sabermetricians have led a grassroots campaign to remedy this, and as statistics continue to gain acceptance, he has benefited by winning the American League MVP twice. But Trout has recently been injured, as Cueball says, which may impede his march into the record books somewhat. If Randall, like me, gets all his baseball news from FiveThirtyEight, he might have a much deeper knowledge of the statistics used in sabermetric baseball analysis than the actual game itself. On-base plus slugging is the sum of on-base percentage (proportion of at-bats at which a given player reaches a base) and slugging average (batting average weighted by the number of bases reached). It was one of the first sabermetric statistics, and 'widely considered to be the best all-around measure of a batter's performance' (according to tvtropes at least), but has nowadays often been supplanted by more advanced statistics. You mean the "New York Giants of San Francisco?" No, the New York Giants of San Francisco play cricket. The New York Giants of New Jersey play ultimate frisbee. Stick with what you know; Quidditch. There are probably more football and baseball teams that play their home games outside the city limits of their nominal city than within them. Downtown land is expensive, and stadiums take up a lot of it. My Minnesota Vikings solved that little problem. I might well be wrong about this, not being from the US, but I thought all these teams played in different areas because they keep threatening to leave $CITY unless it throws tax breaks and new stadia at them, and every so often a city calls their bluff, so they head off to wherever the sun is shining and the money fountain is flowing. But why do they then keep their city name? I thought the Springfield Isotopes would be renamed to Albuquerque Isotopes when they were moved. But surely the city name belongs to the city. Shouldn't they have to license it if they move? Silhalnor wrote: I don't even know how to intone the words. Is "on-base" a verb? Is it a noun like "home base" in base-ball? What does it mean to "slug"? It is trickier to parse than "the gostak distims the doshes", but I'll have a go. Mike Trout's on-base plus slugging has been at career highs. Something has been at career highs: that thing is "Mike Trout's on-base plus slugging". Now we have a bit of a dilemma. It could be "(Mike Trout's) (on-base plus slugging)" or it could be "((Mike Trout's) (on-base)) plus (slugging)", where "slugging" is not attributed to Mr Trout specifically. However, this is unlikely given that the whole conversation appears to be about Trout. Now to the crux: what is this thing "on-base plus slugging"? Clearly the whole phrase acts as a noun. "plus" is probably a coordinator (a conjunction in the old money); "slugging" could be a noun in its own right, so it all fits as long as "on-base" can be a noun. Can it? One option is that "base" is the head, with "on-" being a modifier. Maybe there are "on-bases" and "off-bases". But (and here I'm introducing some minimal domain-specific knowledge) it doesn't seem likely that a "base" could be at career highs, nor that a base would be attributable to an individual player. I'm forced to conclude that there's something missing. "on-base plus slugging" appears to be some kind of performance indicator. Whilst "slugging" could potentially be something you can count (maybe the number of times he has slugged), "on-base" must be missing a noun. At a guess I'd expect it to be something like the "on-base average" or "on-base index" or "on-base ratio". And in reality, "slugging" is probably short for "slugging rate" or "slugging quotient". The two metrics are added together to provide an overall performance indicator "on-base index plus slugging quotient". ((Mike Trout's) ((on-base [index]) plus (slugging [quotient])) has been at career highs. I'd be amused to know how hilariously far out my interpretation is. HES wrote: But surely the city name belongs to the city. Shouldn't they have to license it if they move? You're right. If the Hobart Highly-Successfuls move out of the City Of Hobart, there must be a financial agreement to let the insecure money-grabbing entity keep on associating itself with the more definitive and uncontested owner of the name. I would have guessed that "plus slugging" was a thing and taken "on-base" as either a modifier phrase or a noun creating a compound - comes to the same in this case for intonation purposes, with the emphasis falling really heavily on the "on" and "plus". Treating "plus" as a conjunction makes a good bit more sense. From personal/local experience, I can testify the "new stadium blackmail" game is one that continues to be played by pro sports teams in the US. And they did it quite well here in Minnesota. My Minnesota Vikings are hosting Super Bowl LII this February in their shiny new $1Bn US Bank Stadium (slightly less than half paid by the state, the rest by the team). But their old MetroDome was really a dump. It was one of the last few "multi-sport" stadiums built...and that was 37 years ago. The Minnesota Twins (baseball) shared it with the Vikings until 2010 when the County caved in and instituted a rise to the sales tax, to fund Target Field in downtown Minneapolis. The hockey team left for Dallas many years ago, and the Minnesota Wild NHL team only started after the city of St. Paul agreed to build them a new place. Even the Timberwolves (basketball) have connived to get a multi-million dollar 'upgrade' to their facility...and they haven't even made the playoffs (and in the NBA it's more than half the teams) in over a decade. Most of the professional teams in the "Big 4" sports leagues over here are named with the city where they play. There are less than two dozen of the 123 teams not named after a specific city they play in, and all but four of those carry the name of the state. (I mean, seriously, who would cheer for eh Foxborough Patriots?) And when/if they move they leave that city name behind, but (usually) keep the mascot. So the Los Angles Rams (NFL (American Football)) moved to St. Louis and became the St. Louis Rams (after the St. Louis Cardinals moved to Phoenix and became the Arizona Cardinals)...and are now the LA Rams again when the big money came calling. The will be sharing their new stadium with the Los Angels (late of San Diego) Chargers. Those Los Angles Angels...they moved to Anaheim became, for a while, the California Angles, but are now officially the Los Angeles Angels of Anaheim. Which probably isn't as weird as the NBA New Orleans team moving and becoming the Utah Jazz. New Jersey Nets moved and are now Brooklyn Nets. Florida Marlins became the Miami Marlins without moving...except into their new stadium, paid for by...Miami. On-base plus slugging (OPS) is a sabermetric baseball statistic calculated as the sum of a player's on-base percentage and slugging average. Essentially, [how often they get on base] + [batting productivity (with more weight given the further they make it around the diamond per hit)]. DavCrav wrote: I might well be wrong about this, not being from the US, but I thought all these teams played in different areas because they keep threatening to leave $CITY unless it throws tax breaks and new stadia at them, and every so often a city calls their bluff, so they head off to wherever the sun is shining and the money fountain is flowing. That happens quite a bit too, but in those cases they generally move to an entirely different metro area and change their name. The Baltimore Colts didn't keep calling themselves "Baltimore" after they moved to Indianapolis. Tax breaks and city funding don't drive relocations from one suburb to another to the same degree, because the political pressure isn't there. Residents tend to not particularly care if their team plays five miles north of the city limits vs five miles west. If anything, they mostly prefer not to have the team too close to them, so that they don't have to deal with the traffic and crime issues associated with stadiums. speising wrote: But why do they then keep their city name? I thought the Springfield Isotopes would be renamed to Albuquerque Isotopes when they were moved. For most purposes, Arlington, TX is a part of Dallas. You can travel from one to the other without passing anything that you would recognize as the end of one city and the start of another without a sign telling you so. People who live in one might work in the other. Perhaps more importantly for sports purposes, local TV and radio broadcasts cover both areas, so residents of both are watching the same teams. So it makes sense to still call the team Dallas, particularly since no one outside of Texas has even heard of Arlington. These conditions hold true to some degree for pretty much every city that hosts a team named after their larger nearby neighbor. 'sabermetric' is the adjective used to refer to the more statistically-minded baseball fans, derived from one of their first organizations, the Society for American Baseball Research (SABR), hence SABR-metric. orthogon wrote: It is trickier to parse than "the gostak distims the doshes", but I'll have a go. That was pretty fun to read! Now I want a blog of random analyses like this by someone ignorant of the subject matter with companion analyses of why they got these things wrong and those things right. And apologies to anyone who may have been bothered by my use of "base-ball." I just felt like exaggerating my already deep ignorance to levels heretofore unheard of.